How To Prevent, Repair, Or Remove Rust | Freeway Auto Body Ltd. There is nothing more frustrating that noticing that first spot of rust on your vehicle. Not only is it ugly to look at, if it’s not dealt with properly it will spread, and spread fast. The appearance of rust will also deliver a major hit to your car’s resale value, so unless you plan on driving your car into the ground, you’ll want to do everything you can to protect your vehicle. Fortunately, there are a number of things you can do to prevent and repair rust on your car. Join Freeway Auto Body as we discuss all things rust related, from prevention to removal. 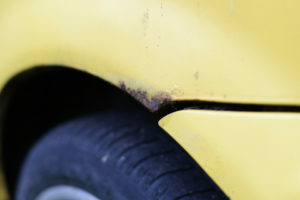 Rust forms when air and water come together and oxidize, forming a crust on your vehicle. You’ll know it by its reddish or yellowish-brown flaky appearance. Road salt can act as an accelerator for this chemical reaction, making your vehicle extra susceptible to rust in the winter months. Electronic Module: This is the latest technology when it comes to rust prevention. A small device is installed in your vehicle that sends a weak electric current through the metal. In theory, this will stop your vehicle from rusting because corrosion is an electrochemical reaction. There are still mixed reviews out on this product, and due to its higher price tag, it’s not the most popular choice among drivers. However, it does keep upkeep to an all time low. Tar-Based Spray: Also known as undercoating, this method involves spraying a tar-like substance on the underbody of your vehicle. Once it hardens, the spray acts as a shield against moisture and salt. Undercoating does not protect your entire vehicle, and it cannot stop corrosion once it’s already started so this method is best for new vehicles. Dripless Oil Spray: This method is popular because it covers the whole vehicle. A colourless, wax-like spray is applied all over your car. The spray is called dripless because it hardens upon drying. There are a few downsides to this method, including drilling into your car’s doors, fenders and other areas to ensure the spray is applied everywhere. More so, due to the viscosity of the spray it can sometimes be difficult to get it into all the tiny nooks and crannies. It’s recommended that you reapply this spray every year. Drip Oil Spray: This is the most commonly recommended method. This spray is lighter than the dripless spray so it’s able to reach more parts of your car. Holes will still need to be drilled into your vehicle to ensure a complete application and it’s recommended you reapply annually. As the name suggests, this spray takes a couple days to dry. The drips it leaves can stain driveways, parking spots and garages, making this more difficult to DIY. Preventing rust here in Edmonton is made even more difficult due to our northern climate paired with a new anti-icing program that is said to be tougher on vehicles. This means it’s more important than ever to keep your car clean and dry, and to talk to a trusted professional about rust prevention methods. While it’s ideal if you’re able to stop the issue of rust before it starts, it’s not always the case. If you’ve started to notice some rust on your vehicle it’s important to prevent it from spreading and causing more damage. The first thing is to determine what sort of rust you’re dealing with. Superficial rust is a relatively easy fix. It usually shows up around a scratch, and won’t have any bubbling paint. Removing the rust can often be done at home. You’ll want to first wash and dry the spot. Use some tap to corner off the rusted area. Then take some fine to medium grit sandpaper and file down the rust – make sure you’re only removing the rust! After the rust is gone, wash and dry the spot again and touch up the paint. When rust goes beyond the surface but hasn’t reached the base metal yet it’s considered scale rust. You will notice the rust is powdery, granular and flakes of metal might become loose and fall off. The good news is that because the base metal has not been compromised, you’re still able to treat scale rust. To correct scaling, you need to get through to rust with a wire brush, use a grinding wheel to remove any roughness and then smooth the surface with sandpaper. Once that’s done, you’ll want to re-prime and paint the area. Eventually the base metal will begin to rust. You’ll start to notice holes where the metal has been removed. You have two options when it comes to repairing penetrating rust, both of which you’ll want to visit your local auto body shop to make sure they are done properly. If you have questions regarding rust prevention or repair, contact the team at Freeway Auto Body today!